Tell us one of the worst fights you ever got into? What's the best dinner you ever had? If you had the opportunity to live one year of your life over again, which year would you choose? What can you always be found with? If you could rid the world of one thing, what would it be? If there was only one left of each of your most favorite things to eat, would you let your best friend have it or yourself? What would you do with it? Tell something that nobody in the group knows about you. If you could only have one thing on a deserted island what would it be? Would you live in space if you could never come back to earth? What is the weirdest most unusual thing you've ever eaten? How many siblings do you have? What was the worst smell you have ever smelled? What do you keep in your wallet aside from money, cards and pictures? What was the worst advice you ever gave? If you had one free day to do anything you want, what would you do? Do you enjoy going shopping for clothes? What's the best sound effect you can make? Have you ever said something you regretted, but were then glad you said it? What is your first thought in the morning? Would you rather always be in a crowd, or be the only person on earth? What will you concoct when you have this person over? If you could meet anyone from the Bible who would it be and what would you ask them? What traditional gender roles do you disagree with? Describe an interesting experience you had the last time your power went out. What was the highest grocery bill you ever had? 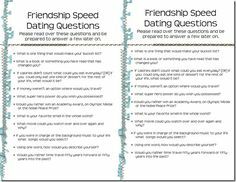 These questions are ideal for speed dating, first dates, second dates, water main hook up third dates. We have over get to know you questions. What would you leave in your will for the person you care about the most? Are you a planner or a procrastinator? What book has influenced you greatly? Why is your favorite color? Name all the vehicles you have owned in your adult life. Would you rather spend the rest of your life in love with a rich person or a poor person? If your house was on fire, what one thing would you take? What is your favorite restaurant and why? If you could erase one day in history which one would it be and why? If you could be a cookie what kind of cookie would you be? When people look at me, they would never guess that I. Name one important characteristic you look for in someone you consider a friend. It can do one trick for you whenever you want, like getting a pop out of the fridge or washing your hair. If you could take back something hurtful you've once said to someone, what would it be? You desperately want something very cool and refreshing to quench your thirst and revitalize your body. What's your favorite song to sing in Karaoke? How many auto accidents have you been in? If you had to be a flower, which one would you like to be and why? What music would your friends be surprised that you own? If you had a magic lamp and a genie who granted you three wishes, what would the three wishes be? If so If you had one song to play at your wedding what would it be? If given a chance to get back to some time during the past, what would be that time and why? If you were on death row, what would your last meal be? Why did you like this person? Name a major life experience that made you who you are today? Who taught you to ride a bike? You were just given a yacht.